With tech companies and governments gathering an increasing amount of information on their users and citizens, privacy has become a luxury. 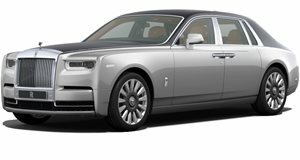 And nobody knows luxury quite like Rolls-Royce, which has delivered this one-off Phantom, loaded with extra privacy features. Beyond the usual isolation that a Rolls-Royce provides from its surroundings, this particular extended-wheelbase Phantom features what the manufacturer describes as a "Privacy Suite.” That starts with a partition dividing the rear passenger space from the front where the chauffeur sits, with an electro-chromatic glass window that turns transparent or opaque at the touch of a button. As our compatriots at Motor1 report, the unique limousine was delivered to a customer in Hong Kong with active noise cancelation technologies to keep the driver from hearing what's going on in the back. There's an intercom system to allow occupants to communicate with the chauffeur, or reject the "call” coming in from up front, and an illuminated opening to pass documents between the two interior areas of the vehicle. A pair of 12-inch monitors are also mounted in the partition as part of the on-board infotainment system, and there are fabric curtains that can be slid over the rear windows. Otherwise it's essentially the same as any other Phantom, but with so few of them made, and such extensive personalization options on offer, no two are likely to ever roll off the assembly line in Goodwood exactly the same. The Phantom is now in its eighth generation – or the second since BMW took over the storied marque. It's the most luxurious yet, stretching a stately 19 feet long, or an extra half-foot in extended form, with a new 6.75-liter twin-turbo V12 to provide "more than adequate motivation” – and every upscale accoutrement they could fit on four wheels.